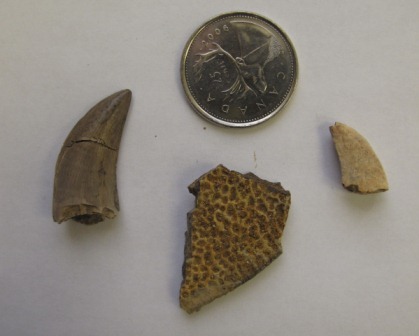 clockwise from top: Quarter for scale, dromaeosaur tooth, turtle shell fragment, tyrannosaur tooth. Photo by Matthew Vavrek. Although the Cretaceous Period was a period of time best known for its multitude of giant dinosaurs, there were still plenty of other, much smaller animals living at the same time. However, these smaller animals present a problem for many palaeontologists because they are so small. A big dinosaur, with large, robust bones is much more likely to become a fossil than a small animal with much more delicate bones. However, sometimes palaeontologists stumble across a treasure trove of small fossils that they call a microsite. These microsites are areas, usually only a few square metres, where there is a large concentration of very small fossils. The fossils found in these areas are often the size of your fingernail or smaller, yet they can contain an enormous wealth of information about ancient, extinct ecosystems. You rarely find complete skeletons in these sites, but rather single, isolated bones and teeth. Luckily, because most microsites contain hundreds if not thousands of individual specimens, we can get an idea of the entire suite of animals present at a single point in time. In an average microsite you might find bones from salamanders, frogs, lizards, fish, mammals, and crocodiles, as well as things like dinosaurs and their descendants the birds. 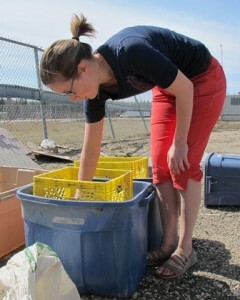 Robin Sissons, PCDI Palaeontology Assistant, works sifting microfossils from sediment. Photo by Matthew Vavrek. Because so many of the fossils in a microsite are so small, it can sometimes be difficult to find new localities. To find them, you often have to look right in front of you, staring at the ground at your feet. Once we do find a site, we first collect everything we can on the surface, and try to find an exact layer that all the fossils are coming from. If we can find the layer of sediment that the fossils have washed out of, we will often dig out sacks of sediment to take back to our lab to screen wash. Sieving the fossils through a screen eliminates a lot of the dirt and sand, and concentrates the fossils so that we can then pick and sort through what is left behind much more quickly. Once we’ve sorted out the fossils from the sediment, then comes the slow process of counting and identifying everything we can, to build up a database of what kinds of animals were present and their abundances. By comparing different sites, we can look at how things like rising sea levels or changing temperatures may have affected the biodiversity in these extinct environments.